This is a cool, and rather unique, guitar from the late ’70s or early ’80s. It is one of Kaman Music’s great experiments. (Kaman is the maker of Ovation guitars.) The Applause line, of course, had the standard Ovation rounded “Lyramold” back. But Kaman was always on the cutting edge, and for these new guitars, the entire neck and headstock assembly was redesigned. Rather than a standard, pieced-together wood neck/headstock/fretboard combination, the Applause neck contained a piece of die-cast aluminum combining headstock, fretboard, frets, and central core in a single assembly. The neck itself was made from molding material called Urelite, made up to look and feel like mahogany. I think the only thing wood on the entire guitar is the (laminate) top. Here is an Applause brochure from the period, detailing how the guitar is constructed, with pictures. Unlike later Applause models, which were manufactured overseas, this one was made at the Kaman/Ovation factory in Connecticut. Also, Applause was a separate company from Ovation at that point. 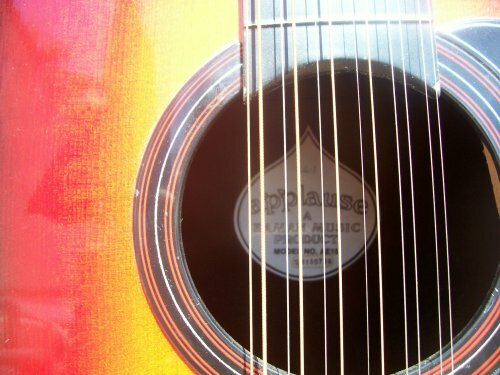 Notice the soundhole sticker does not say “Applause by Ovation,” as they do now, but instead simply “Applause – A Kaman Music Product.” Kaman did not combine the two companies until later. Sounds nice. Plays nice (if you stay away from those upper frets…). Has an under-saddle pickup, so you can plug it in, and it sounds pretty good that way, too. About the only negative is that the neck feels very heavy and unbalanced. But if you play it sitting down, you really don’t notice. At this writing (July, 2013), I still have this guitar. It’s kinda cool. Here is a little more info on the history of Applause guitars (and these aluminum-neck models in particular), for those who are interested.